nice phone overall, review matches the real life, smooth os operation, good screen, ok camera, good battery life. must admit, i am happy with this phone. 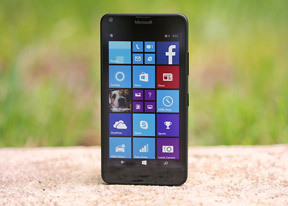 Does Lumia 640 supports CDMA? I bought this phone 1 week ago for only $100 on Swappa and am very happy with it! Very responsive GUI; no hanging or crashing system (which happened often on my Samsung Galaxy Android); every app I need with the exception of Google products (so no Hangouts, native Gmail/YouTube, etc. ); with a little trial and error you will find great 3rd party apps if the original company does not offer a Windows Mobile app; apps like Audiocloud (Soundcloud), 6tag (Instagram), 6tin (Tinder), myTube (YouTube), and Podcast Lounge are very good and some are even better and offer more features than the apps from the respective companies! The HERE maps are very good such as HERE Transit (public transit) and the excellent HERE Drive+, a full fledged turn-by-turn navigation system for your car. The "peak" feature on the lock screen and double-tap to wake are very useful. The phone is light and thin and with the cheaply replaceable battery back cover that wraps around the edges, dropping your phone is no cause for worries anymore. For $8 you can make it look new again. No more scratched bezels that are not replaceable! This to me is one of the most underappreciated design features of the plastic Lumias. Together with the replaceable battery and up to 128GB external storage this phone is made to last (and you can set your phone to store nearly everything there by default; so no more fiddling with App2SD and the likes...). The introduction of customizable folders in Lumia Denim is very well done, as is the entire design language (especially if you come from the fragmented Android world as I did). However, the reviewer made one mistake in chapter 6: "Camcorder (...) allows you to choose the audio bass filter (off, 100 Hz or 200 Hz)." There is no such filter on this model! Anyone can confirm this? In my opinion this phone is currently absolutely unbeatable in the under 200 USD segment. csp, 27 Jun 2015Haay I read some bad reviews on flippant they say that lumias built quality is poor Some of t... moreWho have posted these type of reviews they may have defected product. Because I'm using this phone for two months it's just awesome. No last, no heating problem, nice battery backup. But the problem is cams r not up to the mark and USB cable isn't included also the earphone isn't good. good phone ,lag free performance only who like windows os will accept this. The price is still high. In India 3G dual sim is available for 8500 and Yu Yuphoria with 2GB RAM and 4G is available just for 7000. Of course this has better camera and Microsoft OS is really good but still Yuphoria is more value for money. Miracast is not mentioned again. Don't go for perception as far as practicality is concerned windows Lumia is best.i have used them as will continue to use them as well. Do not congest the RAM, install whatever necessary app suit you, then you feel the 1GB RAM work nicer. It a decent gadget with affordable price. That what BUDGET really mean. If you talk about high end unit, that a separate story..and its not suit with this budget subject.